From the earliest days in the history of glass, there has been the desire to decorate vessels with various designs or to personalize them in some way. A convenient technique, and one that requires an absolute minimum amount of equipment, uses any pointed implement harder than the glass itself. 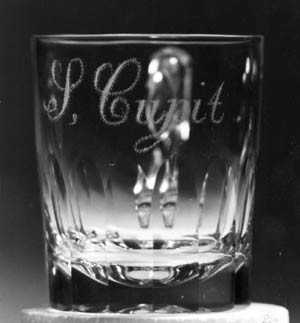 Glass so inscribed is said to be engraved by diamond-point, named after the stylus probably most commonly used, at least by professional engravers. The scratchings can consist of a series of short and long lines, or the glass can be “hammered” with countless tiny dots, a specialization called stippling. The latter technique was brought to perfection by Dutch engravers during the eighteenth century and has been revived by a few English craftsmen since the 1930s (Newman 1977). Examples of diamond-point engraving range from the elaborate calligraphic work of sixteenth century Venice, and seventeenth century Holland and England, to simple initials and names. 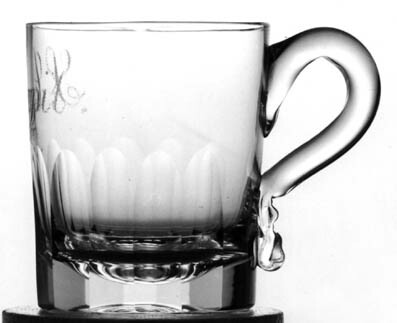 One can find glasses made for supporters of the Stuart cause in mid-eighteenth century Britain, as well as efforts by contemporary poets, such as the poem “Your welcome, Willie Stewart” by Robert Burns, said to have been scratched on a pint tavern glass by the poet himself, much to the displeasure of his landlady, who subsequently sold the glass for a shilling (Fleming 1938)! It is difficult today to find well-executed, authentic examples of diamond-point engraving outside museums. This is especially true in this country. Most of the antique examples in the marketplace today are probably European, as is the mug illustrated here. It was first identified by the writer as American; only later did he discover that it was purchased in England by the seller. There are, however, any number of similar mugs, without diamond-point engraving, that are unquestionably American. It is truly a trans-Atlantic form. Unground concentric corregations on the base of this mug suggest that it was blown in an open mold (for shape only), then transferred to a pontil in order to fire-polish the rim and apply the crimped handle. Colorless, lead glass. The sham base can also be found on American mugs of the period, for example William Dorflinger’s christening mug of 1856, which is shown in Feller (1988, p. 15). The mug’s ground and polished pontil scar is wide and deep as can be seen in the photographs. The cutting wheel was also used to produce the basal flutes; there are fifteen, each 2.25″ (5.7 cm) long. The mug probably dates from the middle of the nineteenth century. The care taken in executing the name in diamond-point suggests the work of a professional workman. H = 3.75″ (9.5 cm), rim D = 3.25″ (8.2 cm). The mug sold for $150 in 1987.